Written by Wei JI an Independent wildlife researcher who provides advice to the Chinese government. Ten years ago, in June 2007, Chad and Zambia proposed a complex package of African elephant trade regulations. Essentially, the two countries proposed a one-off sale of ivory in return for a “9-year moratorium” on sellers’ ivory sales thereafter. The one-off auction was completed in November 2008. Four African elephant populations — Botswana, Namibia, South Africa, and Zimbabwe — sold 101.7 tons of ivory from registered Government-own stocks. The buyers were from China and Japan and they paid USD15.4 million. Since then, an effective ban on the international commercial trade of ivory has been in effect. In October 2016, after several serious delays and extensions, a vote to extend the decision-making mechanism for future ivory trade was defeated. In November 2017, the 9-year moratorium expired. We must bear in mind that when a species or population is listed in Appendix II of the CITES treaty, that species or population is not necessarily threatened with extinction in biological terms. 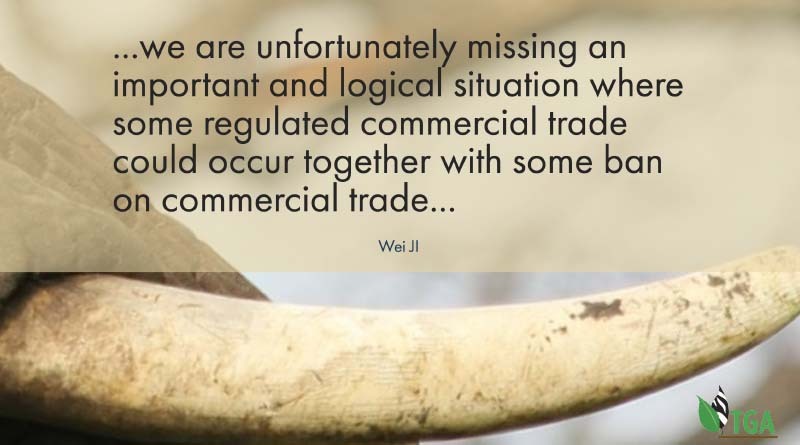 Rather, commercial trade is allowed so long as it does not have a detrimental impact on the survival of the species. This applies to most Appendix II-listed species. However, the African elephant is a very special case. It is distributed unevenly among 37 African countries and is split-listed in both Appendices I and II. The 4 Appendix II-listing range states hold at least 250,000 African elephants out of 410,000 in total, while 33 Appendix I-listing range states hold around 160,000 African elephants. Each and every time a discussion is conducted on whether to allow commercial ivory trade to resume, a hot and polarized debate occurs. In the hope of avoiding such a debate, the 2007 mechanism is proposed for use again— a one-off sale followed by a 9-year moratorium thereafter. If the four range states would have known that the mechanism would end up being disapproved in the future, the original compromise might not have been made. In short, the 9-year moratorium and one-off sale should be regarded as a symbiotic relationship to live and die together. As a gentleman’s agreement, the four range states fulfilled their promises for a 9-year moratorium. However, an effective ban on raw ivory trade is still in place, waiting for new proposals to change matters in 2019 at the next Conference of the Parties of the CITES treaty. The problem with the continuation of the moratorium, even though it was supposed to end, is that Appendix II-listing African elephant populations have to be conserved in a manner applying to Appendix I African elephant populations in terms of ivory trade. In practice, wildlife conservation efforts should be made at population levels rather than species level. The management of an endangered population is definitely different from the management of an over-populated one. It is quite unfortunate that all elephant populations, no matter what status they may be in, are treated in the same way, essentially supporting the effective ban on ivory. and an effective ban on commercial trade (1998-to present with a split-list between Appendix I and Appendix II with annotations). However, the fate of different populations of African elephants has become difficult. Some are increasing with virtually no poaching threat, while some are decreasing due to poaching. It is noteworthy that the four Appendix II populations grew in numbers much more robustly than the thirty-three Appendix I populations over the last forty years. As a result, we are unfortunately missing an important and logical situation where some regulated commercial trade could occur together with some ban on commercial trade (split-list in Appendix I and Appendix II without annotations). In this situation, each and every African elephant range state could determine their own intentions without interference from outsiders and without interfering with each other. Each and every African elephant state could choose the best way to deal with its own populations according to their conservation needs. I sincerely hope this situation could come to fruition in the near future. When you think about it, where elephant populations are grossly excessive, as in Southern Africa, they ARE actually endangered by their potential to destroy the habitat and to cause their own destruction and that of other animals in that area. Bringing elephant back to correct population levels and carrying out sustainable utilisation will, in fact, save them from extinction. Response from the TGA CEO: The TGA doesn’t have to think about this comment. We have known it all along. And we have presented this information to our viewers in the hope that “someone” will come to this conclusion and make this statement – as has now here happened. It is better that this conclusion be drawn and presented by “someone” other than the TGA. Well done. Now EVERYBODY will understand – and THEY WILL NOT FORGET. I want to first tackle some of the assumptions you have made in your letter. I don’t want the TGA to be accused of anything more in this debate other than the things it is truly guilty of! 1. Show me where the TGA has ever said that it does not WANT to get involved with the canned lion breeding (CLB) controversy. We have never said that! We have, however, always been of the opinion that the TGA should not get involved with ANY of the “domestic affairs” of the wildlife industry. Our job is to fight the animal rightists not our own hunting-friend colleagues; and, because we don’t want to amplify the CBL problem, we have been reluctant to even scratch the surface on this subject – until now. But there is so much animal rightism involved in the CBL controversy today that we cannot now avoid getting involved. So, I hope this explanation sets the record straight. 2. I don’t think that the TGA is unaware of ANY of the important points in this controversy. But I invite you to catalogue for us just what you believe those important points to be”. Such a list would help us in our deliberations should the TGA be invited to investigate the CBL industry. 3. YOU state that “us hunters” condemned the practice of CBL. That sounds as though ALL South Africa’s hunters disapprove of CBL and the so-called “hunting” of captive bred lions. THAT is not true. There are a lot of hunters – rightly or wrongly – who approve but, yet, who would like to see the norms and standards improved. Be aware that it is an animal rights strategy to make an unsubstantiated statement and then to continue with a public dialogue as though that statement was gospel fact. That is how they project their fabricated “truths” into the public domain. We blame the animal rightists for doing this – when they say, for example, that “society” disapproves of ALL hunting – which is not true. So, we must not be guilty of that self-same offence ourselves. 4. The general public is upset by “canned lion hunting” because the man-in-the-street has been conditioned to think in that dimension – by the animal rightists; by the press; and by those ‘ethical’ hunters who – rightly or wrongly – are personally disenchanted by the idea of hunting/shooting “tame” captive bred lions. The public had no notion about the rights and wrongs of the subject until it was forced down everybody’s throat by people – on both sides of the fence – with a personal vested interest in doing so. 5. Hunting is ALREADY a delicate issue – because of the negative exposure it has received from the animal rightists; from the press; and from the utterances of hunters, too. And you say that because “hunting” is already a “delicate” subject that “dicey practices” should be discouraged. What “dicey practices” are you talking about – maybe CBL and the shooting of captive bred lions? Who says CBL is a “dicey practice”? Where has it been recorded in an objective and generally accepted report? Nowhere! So, if YOU say that CBL is a “dicey practice” then THAT must be YOUR personal opinion (preference). And we cannot move forward in this quagmire by acting on different people’s “personal preferences”. THIS has been the most important problem facing this whole debate: i.e. the pro’s, and cons, of the issue have thus far been driven by different people’s “personal preferences”. And, in many cases, the people expressing those opinions have not investigated the veracity or otherwise of the personal preference statements that they make. We must not try to – and cannot – resolve this CBL controversy at the personal preference level. It can only be resolved by an objective evaluation of the FACTS. And the TGA proposes that – in the absence of any other takers over the years – that we carry out an objective investigation into the CBL industry, on everybody’s behalf. 6. Those people who disagree with this approach should be aware that there are many “other” segments of the wildlife and hunting industry that can very easily be construed as representing “canned hunting”. So, if hunters side with the animal rightists NGOs on the subject of “canned lion hunting” – on the basis of personal opinion only – and the hunting of captive bred lions is banned as a consequence, they may very well end up shooting themselves in the foot. So, we have to be careful how we play this game. I believe the banning of CBL and the “hunting” of captive bred lions, can and should ONLY be determined – yea or nay – on the facts of the matter; and it is in pursuit of the “facts of the matter” that the TGA is proposing that it makes itself available to determine just what those facts are. 7. Your letter leaves me with the impression that YOU believe that the TGA directorate approves of the CBL industry; and because other people reading your letter will no doubt be left with this same impression, I have to record my disapproval of the tone of your letter. In my report I very clearly point out that NOT ONE of the TGA directors APPROVES of CBL or of “canned lion hunting” (as these subjects have been publicly portrayed by the animal rightists and the press). I cannot state the TGA’s position any more clearly than that. 8. In offering to investigate the CBL industry, it is the TGA’s simple intention to get the facts together for everybody’s elucidation. And once that has been achieved everybody will have an objective baseline on which to determine how they believe the CBL industry should move forward; or if it should be banned once and for all. Elephant population in Eastern Africa has been halved during the de facto commercial post-Convention ivory trade ban. We must face the question very straightforwards: Could we save Eastern African elephant by banning the trade of Southern African elephant ivory? The reality has shown us an honest and bitter answer: NO. I am of the opinion that sane people should not doing the same thing over and over again and expecting different results.